Since the early 1990’s, North Dallas has grown at an above average rate. The Dallas North Tollway Extension Project was just in the beginning stages, and it quickly drove small and large businesses, to look for a Dallas office space for rent along the new tollway. In addition, Downtown Dallas dwellers began to relocate to the suburban areas that surrounded the project area. In 1968, the initial segment of the tollway ran from Interstate 35 E to Interstate 635. In addition to the tollway, there are many major routes nearby. These routes include the Central Expressway, I-635, I-35 and the George Bush Turnpike. Access to these major routes provides multiple cross-over points for the suburban areas of the Metroplex, such as Plano, Frisco, Richardson, and Carrollton , and makes commuting between businesses and popular residential areas easier. The new segment of the tollway attracted a diverse mixture of business types and sizes from other areas of Dallas and outside of the city as well. 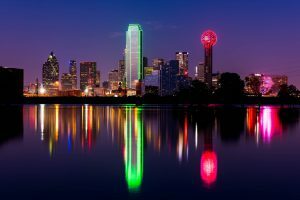 Thus, North Dallas is now the home of several large corporations such as, Centex Corporation, Celanese, Exxon Mobile and Atmos Energy; just to name a few. The area also encompasses more than 100 restaurants. Locating to an office space that is surrounded by these kinds of characteristics generally improves visibility, traffic, cost of operations, and employee morale. As the local businesses and residential areas in North Dallas have grown, so has the labor pool. People in remote areas are willing to commute, due to the ease of access to major routes. Working closer to home and having the ability to easily travel to shops and restaurants are only two advantages to name. In addition, the lease rates for office space in this area of Dallas are very competitive compared to other areas. It’s not surprising that some of the fastest growing cities in the country surround North Dallas, when you consider local density of small and large businesses, accessibility to major routes of transportation and close proximity to popular residential areas. Leasing office space is a big decision with many factors to consider; namely location. For business owners looking for prosperity and change, relocating your business to North Dallas is a step in the right direction.